Traditional Bread Stuffing - easily and deliciously made vegan! You guys!! 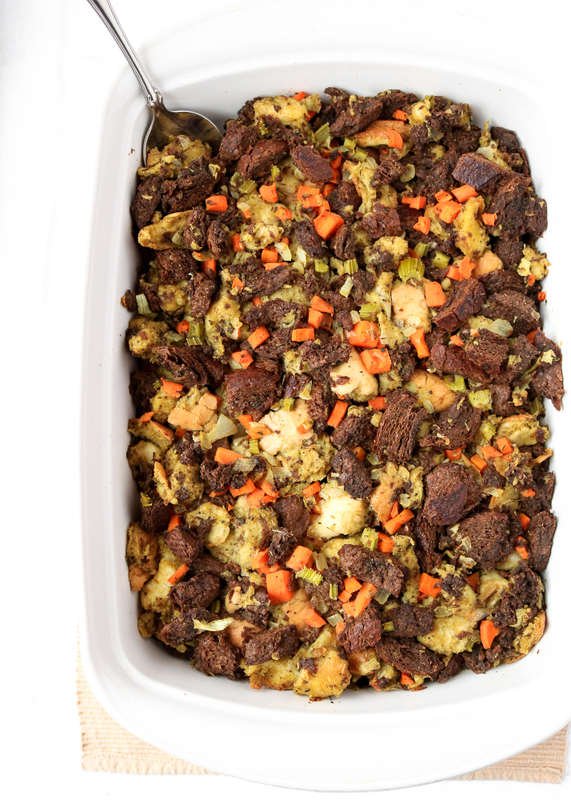 This Traditional Bread Stuffing is an amazing side dish for your vegan Thanksgiving table. It’s easy to make and oh! so delicious. Thanksgiving 2015 was my very first holiday as a full-fledged vegan. 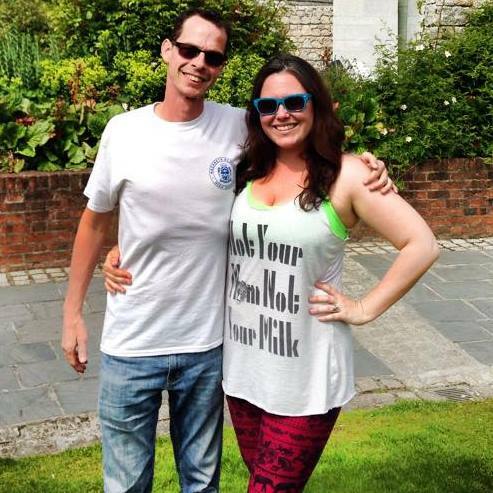 The first holiday after you make the switch to this life can be kind of confounding. I totally thought I’d be resigned to eating nothing but bread, salad, cranberry sauce, and maybe, MAYBE a few “Oh! These just happen to be vegan!” side dishes: ones that happened not to be drenched in butter or some cream sauce. Then I thought how easy it would be to veganize my father’s traditional bread stuffing recipe with just a few simple, really simple, substitutions… and a few omissions. Apparently, B was not a fan of the idea. B, at first, was against the idea of “any stuffing” because she had thought – due to a “traumatic childhood experience involving oyster-stuffing” that we won’t go into fully here, that all stuffing was made with oysters, and all I could say was “What the hell are you talking about?” I explained that although oyster-stuffing was a thing, it wasn’t the only thing. I proudly told her I would veganize my dad’s traditional stuffing. She wasn’t excited and mumbled something about “wet bread” under her breath. She came back with the ingredients, and as we began to break the bread apart to toast it (a little hack if you’re short on time), I told her about how I used to make a version of this stuffing with my dad and how easy it would be to veganize it. I told her how we would go out and get massive amounts of bread (I have four brothers and extended family always came too… big table) the day or so before Thanksgiving and we would sit around together in the living room with bags of bread around us and large cooking pots in front of us watching whatever Christmas specials were on. We would break the bread apart the night before so it could dry out nicely and be ready to accept all that great-tasting liquid without becoming mush. Of course, B began to tear up at the story. She watched as I moved around the kitchen, chopping and mixing ingredients. B had next to no cooking experience at this point, so she said what I was doing seemed like magic and that I “seemed to just throw ingredients together helter-skelter.” She was intrigued though, and we finished the recipe together. After a while, the room filled with a beautiful savory aroma that brought back so many memories of Thanksgivings past spent with family and friends, and B and I began to share some great memories and to list some of our favorite holiday recipes that we could start to veganize from now on – like these walnut sausage and stuffing balls we made with the leftovers! If you’re new to vegan cooking, you may think the holidays mean you have to completely change what you’re eating. But, with a little forethought and some help, you’ll soon realize that doesn’t have to be the way at all. Plant milks, vegan butters, cheeses, they are all in abundance. Whatever we can help you with, whatever recipe you may want to veganize, let us know. We’d be glad to help! Wanna see how easy it can be to make this Traditional Bread Stuffing? Check out this 60-second video! 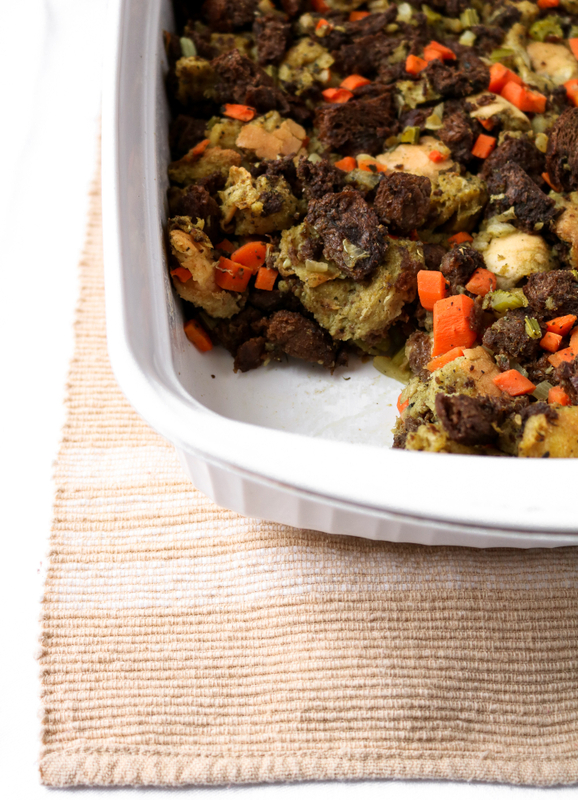 This traditional bread stuffing is sure to become your favorite Thanksgiving side dish! It's warm and comforting and full of that homemade love and warmth. Simple methods and ingredients too! 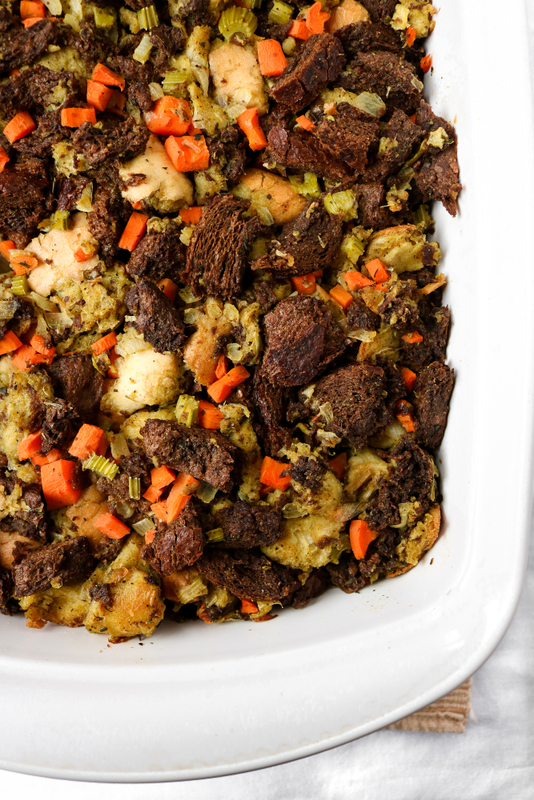 The night before you make the stuffing, rip the bread into bite-size pieces and leave it out over night. You can also throw them in the oven at 350F, checking and stirring every five minutes until they are dry. Add to a large mixing bowl when the bread is dry. If it's not already, preheat your oven to 350F and spread some coconut or olive oil on the surface of a 13x9 (or larger) casserole dish. Mince your carrot, celery, and onion and sauté in olive oil over medium high heat with a pinch of salt until onion is translucent (about 7-10 minutes). Add these veggies to the mixing bowl with the bread. In a small bowl, whisk together your bouillon and spices with the warm water. Slowly pour the liquid into the bread and veggie mixture, tossing with your hands to make sure it is well incorporated throughout the mixture. Transfer bread mixture to the oiled casserole dish. Bake for 20-25 minutes or until desired consistency is reached. Some may like it a little dryer, others a little wetter. Adjust to your preferences.